A youth was killed at Milanpur area in Pathsala under Barpeta district on the Indo-Bhutan Highway at 8.15 pm on Sunday as a speeding truck from Bhutan hit the bike which the victim was riding. 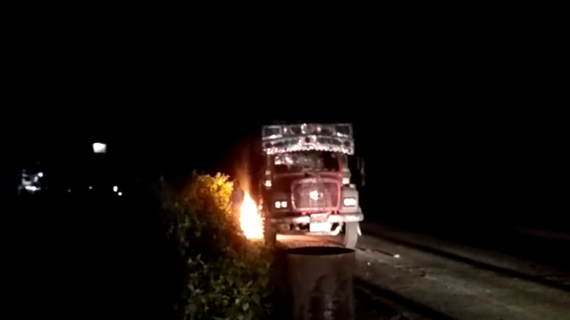 Following the death of the youth on the spot, the locals set the truck along with another truck on fire. The deceased, who was mowed down by the speeding truck, has been identified as Ranjan Barua, a local of the area. As per information, the incident took place when the local youth, who was on the way to the market riding his AS 15-B-4645, was hit by the truck from Bhutan with registration No BP2-A-3806 from the back side. The youth died on the spot. Immediately after the incident, the locals chased the truck and were able to stop the truck. “Later the irate locals set the truck on fire besides one more truck on the highway. However, the police arrived at the spot and controlled the situation,” informed sources. It may be mentioned that due to reckless driving without following rules and regulations, several road mishaps take place on the road involving trucks. The youth is survived by his wife and a daughter. The situation still remains tense in the area. The irate mob also pelted stones at the Pathsala Police Station for inaction against reckless truck drivers.